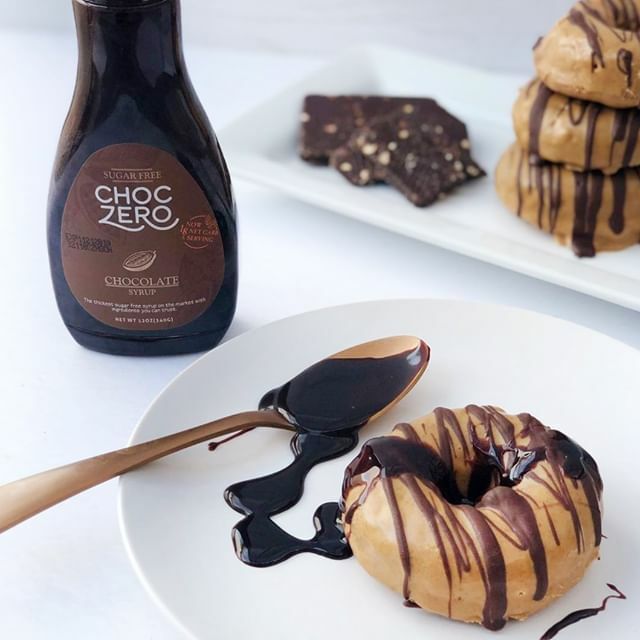 Choc Zero Syrups are the perfect topping for any Keto Dessert. I put these low carb syrups on all of my favorite dessert recipes. And after being sold out for months, Choc Zero finally has my favorite flavors back in stock! Maple Pecan, Chocolate, Caramel, and strawberry syrups are all back! Looks like it's time to bust out my favorite Keto Waffle Recipe this week. Breakfast for Dinner? Yes, Please! These syrups have been sold out for ages, so order now before they run out! These syrups go great on everything. With only 1g of net carbs, Choc Zero’s Honest Syrups pack the sweet punch you crave with out any of the sugar. They use only natural flavoring and monk fruit to flavor their low carb syrups. I like to put them on breakfast foods, Keto Ice Cream, Cookies, and even my favorite J and S Sweets! These Keto maple donuts were already good! Add some chocolate syrup to take them to the next level! They have all sorts of different flavors. They have just restocked the Maple, Maple Pecan, Chocolate, Vanilla, Caramel, Strawberry, and Pumpkin Pie Syrups. Some of them are even 50 cents off! You can drizzle this syrup over Keto Cake, or make these Pumpkin Baby Bundts and top them off with the Maple Pecan syrup. Choc Zero doesn’t produce a bunch of excess product. That means that they sell out quite often and quickly. These syrups won’t stay in stock for very long, so order yours today.